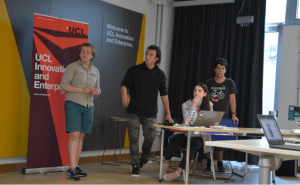 On the 2nd of June, UCL’s Digital Education ran #LearnHack 4.5, a day of problem solving, tackling challenges around technology and learning. 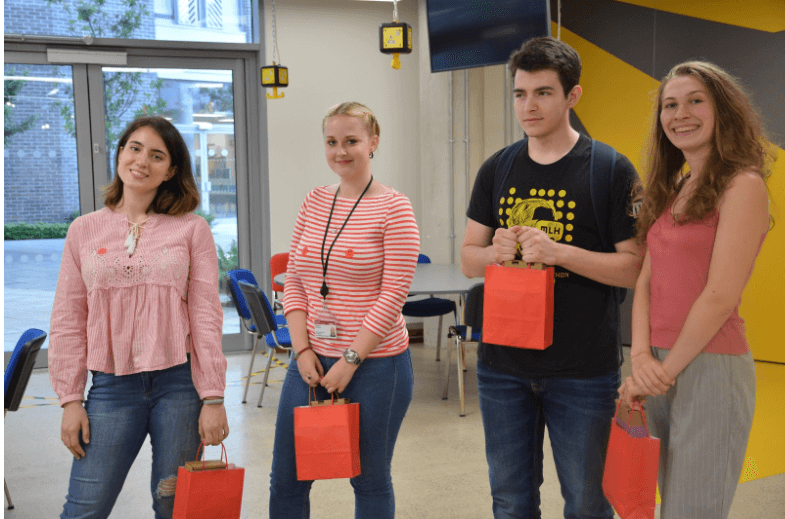 Students and staff from different departments in UCL came together in BaseKX to solve a challenge, share their ideas and make new connections. What started as being an event that aimed to explore how technology is being used for teaching and learning, became a common ground where students and staff can work together towards achieving a common goal. The rest of the day was a good opportunity to have a lot of fun while debating, prototyping and working as a team. The participatory format and the friendly environment enabled collaboration and lots of discussion about ways to tackle the challenges. Even if the day was very labour intensive and tiring, the food, snacks, drinks and sweets provided kept everyone going. Also, the wonderful culture of community and collaboration remains a constant characteristic for each and every #LearnHack. Being an event that explores the topics of learning and technology, two optional workshops were delivered throughout the day in order to nourish the learning and knowledge sharing atmosphere. The first workshop, ‘Primer on Visual Abstracts’, explored how to increase the impact of one’s publication, through image conceptualisation. Meanwhile the other one, ‘Putting it all together: R and R Markdown’, investigated how one can combine formatted text and analysis code to build up-to-date reports. These workshops were a good way to learn some new skills, but also to take a well-deserved break from all the hard work to solve the challenges. The final presentations were the moment when each team introduced their solutions, ideas and prototypes and told everyone about their findings. Through presentations of just a few minutes, the teams managed to prove that they came up with tangible, creative and useful solutions to every challenge. Even more, they all handled the questions coming from the public and the jury like pros. This team responded to the challenge Hacking #LearnHack by creating a strategy plan to improve the reach, recognition and impact of future #LearnHacks. They also responded to this conceptual challenge through a technical measure, by creating a prototype for a brand new website. The app that Team Regatta came with responded to the ‘Predicting when Assets will Fail’ challenge. 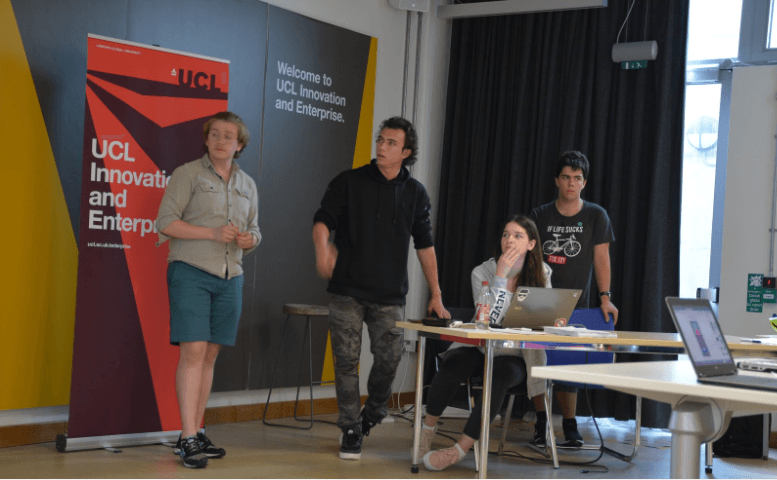 They decided to tackle the issue by creating an app that could be used by the UCL staff to report maintenance issues. They designed a centralised system through which data could be stored in a easy to use, and easy to analyse manner. This team decided to build a model to evaluate the probability of assets failure, so the problems could be fixed before even happening. They analysed the data by taking into account the historical maintenance and the environmental factors. The approach that this team took was very data heavy, since they managed to map out most data sources throughout the day. 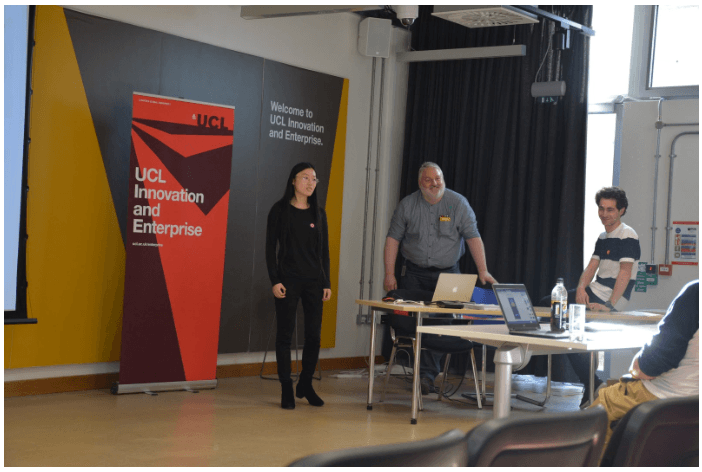 Responding to the challenge of building an intranet for students, team Lime Pair built their prototype that would incorporate on the same website page, all online resources that are vital to all UCL students: Portico, Moodle, Library Services and others. #LearnHack proved once again that it not an event for techies only. Don’t be fooled by the name. This one day hackathon brings together researchers, creators, artists, visionaries, thinkers, designers, inventors, dreamers and many others. You don’t identify with any of these? No problem, we are always open to new suggestions. UCL School of Pharmacy is actively involved in the development of a number of innovative approaches to develop teaching and learning and to further embed technology-enhanced learning within the MPharm and MSc programmes. A recent example of such an initiative is our highly-successful wiki-based integrated therapeutics project, which continues to help students to integrate their knowledge across traditional discipline boundaries. The launch of a newly-designed and updated MPharm programme in 2013-14 and access to new technologies has encouraged further innovation, three examples of which will be described. 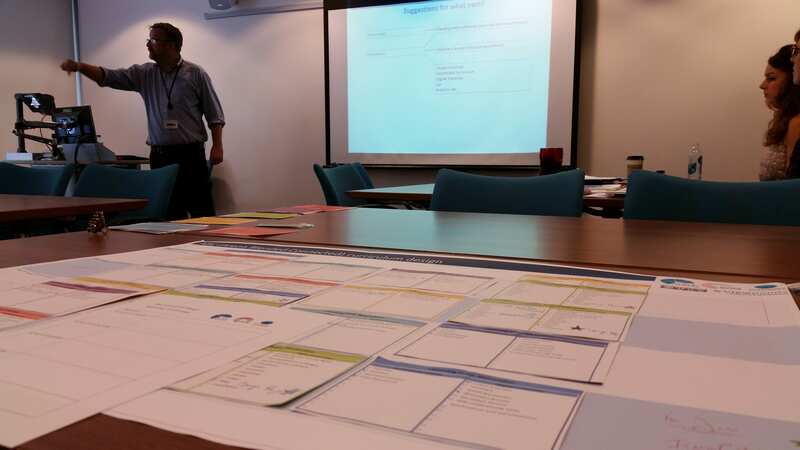 iPad-supported Workshops – Small group-based practical and PBL exercises in which students have access to iPads have become one of the primary modes of workshop-based teaching in the new MPharm programme. Students use web-based resources and information retrieval techniques to solve problems and discuss their approaches in their groups, fostering peer-supported learning. Sessions are supported by faculty and TAs as facilitators. iPads are also pre-loaded with suitable apps appropriate to the session and students can download workshop resources from Moodle then record and submit their results electronically during the session. Research Project Assessment – Starting in 2013-14, the mode of research project assessment was fully revised to incorporate: (a) a project portfolio, in which students record their day-to-day activity with an emphasis on data management, reflection and critical review (of results and key literature); (b) a succinct research paper formatted in the style of a journal specific to the field of research; and (c) presentation of a poster at a mini-conference held at the School, at which staff and students ask questions to presenters based upon their projects. There was a tangible air of excitement and excellent engagement at the poster conference, demonstrating the success of this approach. Green Light Pharmacy Clinical Experience – The provision of clinical pharmacy experience from the start of the First Year is a key priority for the MPharm programme. Students regularly visit our partners at Green Light Pharmacy where they can observe real-time patient-pharmacist interaction through a live video feed to a purpose-built teaching facility on-site and have the opportunity to interact with real patients under the supervision of a pharmacist. The clinical experience offered by these visits has received extremely positive feedback from students in annual module review questionnaires. 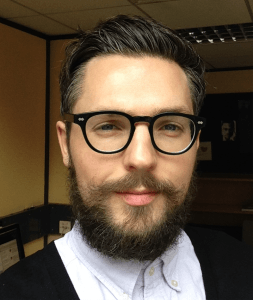 Communications Manager (Education) Luke Davis is the editor of the Teaching and Learning Portal – a one-stop shop for news, case studies and resources on the subject of teaching at UCL. We asked him about his work on the site and how UCL staff can get involved. What can people expect to find at the Teaching and Learning Portal? The aim is to offer everything that a member of UCL staff could need on the subject of teaching. That includes plenty of case studies about new approaches being used inside the university as well as up-to-date news and event info. There is also information on topics such as professional development, learning technologies and education strategy. Day-to-day, I find out about the latest things UCL staff are doing in terms of teaching and then produce new case studies, features and news stories. How long have you been at UCL? Just three months. It’s a big change from working in a small communications agency, but I’m really enjoying it. There are so many fascinating people doing incredible things, and, of course, education is right at the top of the agenda. What plans do you have for the Portal? 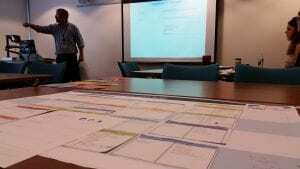 I’m currently working with colleagues in Web and Mobile Services to redevelop it. It’s a big job that will involve lots of user research before scouring all the existing content and redesigning the site. The idea is that we end up with a modern, attractive site that’s easy to navigate and full of up-to-date, useful, fascinating content. We’ve set ourselves the daunting target of having it ready in October. 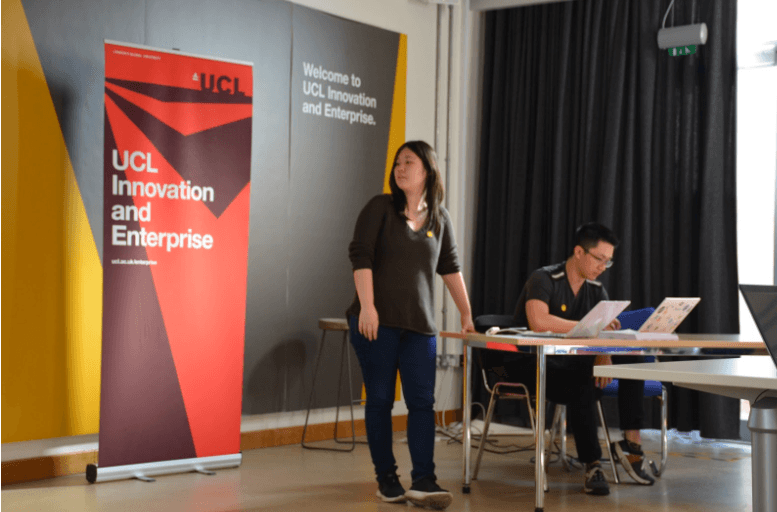 How can UCL people get involved? If you do have a story, or even if you’d just like to suggest a topic for me to explore further, please get in touch. I’m always on the look-out for new leads and ideas. And if you want to keep up-to-date with what’s on the site, please sign up to the monthly digest newsletter. The ‘Virtual Learning Environment’ (VLE) project aimed to develop new online tools to facilitate interdisciplinary learning at UCL. The project was particularly aimed at students registered on multidisciplinary Masters courses, such as the MSc Biomaterials & Tissue Engineering, run by the Department of Mechanical Engineering. The objectives of the project were guided by the pedagogical principles that knowledge acquisition and learning are facilitated by interaction and collaboration with peers. To achieve this, the Virtual Learning Environment needed to offer a way of enhancing student interaction whilst providing an opportunity for peer-to-peer learning that offered unique motivational and cognitive benefits, whilst also enabling students from different background disciplines to grasp basic concepts. Time constraints on a Masters degree course meant it was important to focus the content of the VLE on the fundamental principles necessary for students to grasp key concepts relevant to the course. A VLE was therefore devised to provide online laboratory tutorials (Virtual Laboratory) and an interdisciplinary learning forum (Virtual Journal Club). (1) Virtual Laboratory: The Virtual Laboratory was based in Moodle and consisted of a portfolio of tutorials introduced throughout the course that were designed to prime the students (primarily from an engineering background) with the working practises of a Life Sciences laboratory. This involved producing learning material that could be loaded into iSpring presentations, which were subsequently converted into Flash format for uploading onto Moodle. Topics covered included aseptic tissue culture techniques, micropipetting, centrifugation, cell counting and enzyme linked immunosorbent assays. The latter two topics included mini quizzes and data analysis tasks. These materials were developed with the assistance of student volunteers who were registered on the MSc course. Their work on the project involved capturing video clips of someone performing the techniques, scripting, dubbing and editing. The students were remunerated for the cost of their time working on the project. (2) Virtual Journal Club: The Virtual Journal Club (VJC) was established in My Portfolio. After an introductory session to the VJC to show its contents and workings, a different student was invited each week to review the strengths and weaknesses of a paper they had selected from the recent literature relevant to a topic covered in the course module. An online discussion was then opened up to the other members of the group who participated by uploading a brief posting onto the blog. The VLE received positive feedback from students on the MSc Biomaterials & Tissue Engineering course. An Opinio survey was conducted to evaluate the students’ perception of the VLE. These data indicate students generally recognised the benefits of participating in the VLE, despite many of them not having previously used online or virtual learning environments. The VLE received positive feedback from students on the MSc Biomaterials & Tissue Engineering course. An Opinio survey was conducted to evaluate the students’ perception of the VLE. These data indicate students generally recognised the benefits of participating in the VLE, despite many of them not having previously used online or virtual learning environments. From a course lecturer’s perspective, the VLE enabled me to cover more topics during the limited time available. This was particularly evident in the practical sessions where the students were more familiar with the concepts being introduced. Having already been introduced to some of the techniques with the online tutorials they became proficient with the techniques being used much more quickly than groups taught in previous years. An encouraging result from the survey was the students’ impression that the Virtual Journal Club helped them review literature more critically. This skill is an important component for their laboratory based research project and was something that was clearly lacking in previous years. The project enhanced student learning by providing an opportunity for students to be ‘preconditioned’ for certain aspects of the course prior to classroom based activities. An example of this occurred with the viewing of a Virtual Laboratory movie clip explaining aseptic technique, which was followed by the practical session. By enabling the students to be familiar with the techniques that would be used during the laboratory practical session, time was saved allowing students additional time to reflect on what was being covered during the session. The feedback from the Opinio survey generally supported this observation. The outcomes of the project were in line with the original aims of the project. A VLE has been created and this has been positively received by the students. The VLE has provided an additional tool for cross disciplinary learning. The students were more enthusiastic about the Virtual Laboratory compared with the Virtual Journal Club. After the first few students had volunteered for the Virtual Journal Club, subsequent volunteers were less forthcoming. To encourage participation a different approach will be adopted for the coming academic year, whereby the participation contributes to 5-10% of the coursework module mark. How did the project benefit the student workers? The student workers received training in the production of online teaching aids. They also gained experience in scripting, producing and editing video clips. They also benefitted from financial remuneration on completion of their work. How has the project developed your awareness, understanding, knowledge, or expertise in elearning? The project has developed my awareness of the benefits and drawbacks of e-learning. However, the former are greater than the latter and I plan to continue developing this side of the curriculum. The planned peer-to-peer learning that the project aimed for will only be fully achieved if all the students are fully engaged. Therefore participation rates of the Virtual Journal Club will be monitored and reminders sent for each individual’s contribution. Interest in the Virtual Laboratory and Virtual Journal Club has been expressed by other course coordinators at UCL and it is hoped that similar technology will be rolled-out to a wide range of interdisciplinary courses at UCL. The Opinio survey has revealed areas where the VLE can be enhanced in the future, as shown below. Other members of the department are aware of the VLE and have expressed interest in developing similar strategies for other courses. Additional research questions and developmental ideas are going to be explored in the next academic year. It is hoped these data will lead to a journal publication to enable further dissemination outside of UCL.